Republican People's Party officially joined on Saturday a coalition supporting Egypt President Abdel-Fattah El-Sisi, the Support Egypt bloc, currently being formed in the country's new parliament, a statement by the party read. The Republican People's Party, which is mainly composed of former ministers, has secured 13 seats in Egypt's 2015 parliament. "The revised bill issued by the coalition has taken into consideration our recommendations and responded to the suggestions made by the party," the statement read. The party also explained that they have postponed the decision to join the coalition until they see the amended document of agreement issued by the Support Egypt bloc. The Support Egypt bloc, headed by former intelligence officer Sameh Seif El-Yazel, has been seeking to recruit a sweeping number of parliamentarians to its ranks. The bloc consists of over 400 parliamentarians from various political parties as well as independents, according to its members. A final tally of the bloc's list has not yet been announced. Egypt’s right-of-centre Wafd Party also announced last week that they would not join the coalition. Meanwhile, the Future of Homeland Party, who won 50 party-based seats, the second largest number won in the elections, said it will return to the pro-Sisi coalition after initially declaring that it would withdraw. 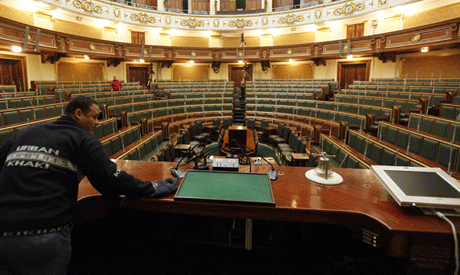 Egypt's parliament is expected to be sworn in by the end of December, and will be composed of the highest number of MPs in the country’s 150-year parliamentary history. The MPs are divided into 448 independents, 120 party-based deputies, and 28 presidential appointees. The majority intelligence officer’s party is busy recruiting more cheerleaders supporting the failed Sisi policies, just to get a piece of the action. The real opposition is arguing over semantics and minutia in protocol and procedures. Despite the fact that this parliament will be composed of the highest number of MPs in the country’s 150-year parliamentary history; they don’t seem to worry much about the looming bankruptcy, the first in the country’s 150-year parliamentary history!